Ariana Harwicz, Die, My Love, Trans. by Sarah Moses and Carolina Orloff, Charco Press, 2017. In a forgotten patch of French countryside, a woman is battling her demons – embracing exclusion yet wanting to belong, craving freedom whilst feeling trapped, yearning for family life but at the same time wanting to burn the entire house down. Given surprising leeway by her family for her increasingly erratic behaviour, she nevertheless feels ever more stifled and repressed. Motherhood, womanhood, the banality of love, the terrors of desire, the inexplicable brutality of ‘another person carrying your heart forever’ – Die, My Love faces all this with a raw intensity. It’s not a question of if a breaking point will be reached, but rather when and how violent a form will it take? This is a brutal, wild book – it’s impossible to come out from reading Ariana Harwicz unscathed. The language of Die, My Love cuts like a scalpel even as it attains a kind of cinematic splendour, evoking the likes of John Cassavetes, David Lynch, Lars von Trier and John Ford. In a text that explores the destabilising effects of passion and its absence, immersed in the psyche of a female protagonist always on the verge of madness, in the tradition of Sylvia Plath and Clarice Lispector, Harwicz moulds language, submitting it to her will in irreverent prose. 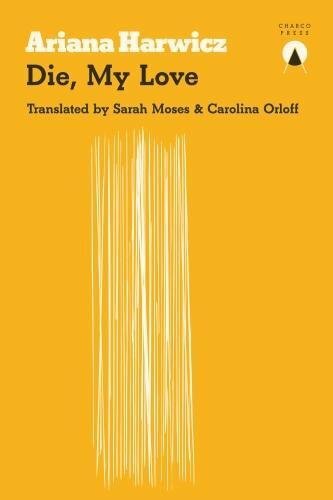 Bruising and confrontational, yet anchored in an unapologetic beauty and lyricism, Die, My Love is a unique reading experience that quickly becomes addictive. Named Best Argentinian Novel of 2012 by the daily La Nacíon. So the thing about Edinburgh Book Festival is the discovery of new-to-me books in their pop-up bookshop … and there were many this year. (I’ll tell you all about the ones that came home with me when Rossetti isn’t looking.) A number of these started their journey to my library from the shelves dedicated to the Edinburgh Book Festival First Novel Award. The contents of these shelves change throughout the festival. Harwicz’s novel wasn’t there on day one. I think I read a tweet saying copies arrived about 3 hours before her event. I wasn’t at her event either, but I decided to read this novel first from my #edbookfest purchases so that I could sneak in a last minute review for both #spanishlitmonth and #WITmonth. Why did I buy it? Title, title, title. I imagined some kind of schizophrenic virago snarling the first word, then, after sticking the knife in, caressing her victim with soft sweet nothings …. and, because this novel is written in 1st person, there were times when I was unhinged myself! I couldn’t recognise the world at all through her eyes. At first there was no common ground, just weird, animalistic behaviour complete with sexual fantasies that turned out (I think) to be anything but fantasy. But gradually, an external reference, an expression of resentment, and I realised that this is a world seen through the prism and alienation of severe post-natal depression. I lay back in the grass among fallen trees and the sun on my palm felt like a knife I could use to bleed myself dry with one swift cut to the jugular. There’s the knife of my imaginings, but it made me question which love was to die. Because with a title like that, something’s going to end badly. And Harwicz kept me guessing. I don’t want to reveal too much about the woman’s story but she is an educated woman, now living in the countryside with her husband and son. Bored. In a downward spiral that is accelerating. The birth of her son precipitating, if not completing, an absolute loss of self. It’s not easy on her, her husband (who really does try to help her), her son (for whom I was truly afeared) or for the reader. That 1st person narrative – it’s not a stream of consciousness, more a stream of existence. Reality, fantasy, insanity, hallucination, smidgeons of logical thought, blended into an unchronological narrative. Challenging. I’d say exhilarating (if the subject matter wasn’t so dark.) Told in short, sharp passages, meaning the reader can come up for air, even if the protagonist and her family cannot. A book that will reward a second reading, if I dare brave its intensity again. Not everything they publish will be for me, but I will definitely keep a close eye on what they do. I was lucky enough to attend the Edinburgh launch of Charco Press, a new publisher of Latin American fiction which is based in the city. (Charco is apparently Spanish for puddle, so Scotland would seem to be the ideal location). The authors of its two launch publications, Ariana Harwicz (Die, My Love), and Gabriela Cabezon Camara (Slum Virgin), were both in attendance, as was co-founder and translator Carolina Orloff; the enthusiasm of all three (and of hosts, Golden Hare Books) was wonderful to behold, and I began reading Die, My Love (translated by Carolina and Sarah Moses) on the train home. It’s not uncommon for the narrator to compare herself to an animal, and real animals also occur again and again the narrative. The couple’s car hitting a stag is one example, a brief instance where the underlying violence of the voice punches through. (The stag survives and will be seen again by the narrator – “The stag used to appear at nightfall and linger between the woods and the garden” – inhabiting the same borderline between domesticity and wildness as she does.) Their dog is injured in the accident, and the narrator’s inability to cope with it whimpering in pain (she asks her husband to kill it) seems to echo her response to her child. Die, My Love is a powerful exploration of the rage and loneliness which can accompany motherhood. Such feelings may not be universal (though many of her thoughts will have occurred to some in diluted form) but neither is it unique. The novel also questions the direction and purpose of relationships, and our roles within them, the narrator’s faltering marriage set against the marriage of her in-laws. It does all this in wild phrases which bite and cut at the consciousness of the reader: Harwicz spoke of a realist novel where the fantastic element lies in the language. Harwicz also said that writing a novel is a matter of life and death, and that is certainly how this novel feels.